Now I am sure that you have heard the old saying ‘Let the punishment fit the crime’. However, have you heard the new saying ‘I want to hold you by the throat until your balls turn blue’? HUH? What do you mean that you haven’t? Then you best watch this 81 minute cartoon made in 2010. Exiled into space by his friends. Crash-landed onto the oppressed planet called 'Sakaar' by fate. Then implanted with an inhibitor disk plus imprisoned by the Red Kings men. And you can safely say that the Hulk is not a very happy bunny at the moment. Moreover, to make matters even more brutal for the Hulk, he and a group of detainees – Hiroim, Korg, Miek, and Elloe Kaifi – are also forced to enter gladiatorial combat for the pleasure of the Red King and his nation. Bugger. No lottery ticket for the Hulk, huh? Heck, the only thing that Hulk and his 'Warbound' manage to win, is their subsequent battles in the area. Mostly anyway. Except for one of Hulk's allies whom dies that I have forgotten to mention. As for the rest of them on the other hand? Well, they are catapulted on down one hell of a roller-coaster ride of a free for all! The Kronans. The Great Devil Corker. The Wildebots. The Red King. And his female shadow-wielding bodyguard, Caiera. At one time or another each and every single one of these foes, feels the awesome power of the Hulk and his allies in battle. Some of them survive – some of them do not – might decides’. Granted, in-between these initial bouts, is a lot of chatter going on as well. Firstly, Hulks allies, 'the Warbound', seal a unifying pact by telling each other their individual origins – except for the Hulk of course. And secondly, the Red Kings bodyguard, Caiere, takes the Hulk to one side and then explains to him about the Red Kings chivalrous origins, plus why he should not involve himself with a future plan devised by Elloe's friends to break her out of confinement. Please note, the plan does not work. Though I suppose that is why what next transpires really kicks off when Hulk battles the Thunder God, Betta Ray Bill. As duplicity is played – confrontations are made – death comes from an old maid – and salvation is eventually paid. Long live the king. And a green one at that. Now I first started reading 'the Hulk' comic book series quite some time ago, when Bruce Jones became the ‘new writer' back in the day. And though I have to confess, that I really did dig his stuff (well, it was good, and some of it was incorporated into the Edward Norton 'Hulk' movie). Afterwards, when he left, and was then replaced by some guy called Greg Pak, over time I began to realize that his stuff was even better (in a manner of sorts). You see, Greg and his new artist at the time, Carlos Pagulayan, took Hulk in a brand new direction that was a complete departure from what I was used to. With Bruce Jones, the Hulk would walk from town to town, and get himself into some mischief (which was somewhat reminiscent of the Hulk TV series). But with Greg, Hulk suddenly turned into some sort of space-gladiator who was fighting on a distant planet. Greg's story stuck with me, and with it, I was introduced to a whole new world of possibilities for the green-skinned galoot. 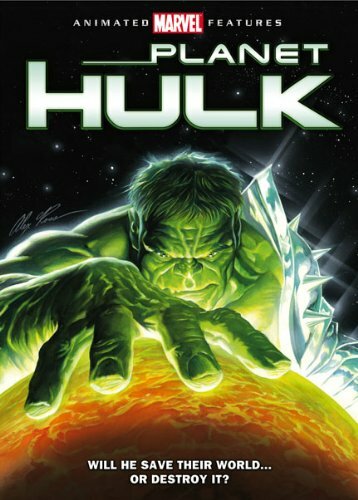 These stories were eventually collected, and entitled the 'Planet Hulk' saga. OK, I know what you are going to ask - so can this tome of material that encompassed two years worth of story, translate into an eighty odd minute cartoon? Surprisingly enough, yes, yes it does! The makers of this animated movie really did try there best to compress this original space odyssey into a rather pithy and bold take. OK, here and there, some of the story had to be omitted (as it would have been too long), some of the characters had to be replaced by others (most notably the Silver Surfer for Beta Ray Bill), and some of the story structure had to be distilled also (focusing it mainly on the arena section of this yarn). Nevertheless, that is not to say that this film is not a good translation! Heck, the only way that the producers could have made a fully-fledged facsimile of the original epic Odyssey, is if the guys and girls in animation-land, where allowed to make this cartoon onto a twenty-part animation extravaganza. Personally speaking, what I liked most about the 'Planet Hulk' movie, was that I could tell a great deal of respect was shown to the original works. And also, that when innovation were made, at least it was in the same spirit to what had come before it. Overall, 'Planet Hulk' is a great stepping stone in comic book to animation translation. In my own opinion, it is on the same par as some of the DC animated pieces, such as 'Batman - Under The Red Hood', (click here for review) whilst at the same time adding a level of action and pace that I have to say was very nice to watch. Great film – great adaptation – Hulk smash!